My initial optimism about doing the piece justice was soon dampened when it came round to designing the drawers and choosing the wood. Although, as my contribution is removable, it would be easy to replace anything which didn't 'sing'. The American cherry carcass took on a very nice orange glow after oiling and being exposed to some natural daylight. 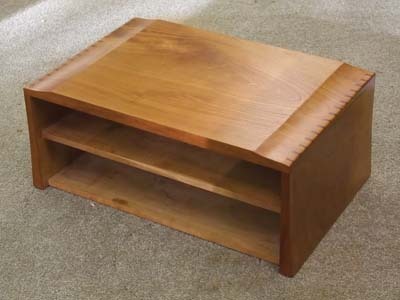 Trying to get cherry drawer fronts to develop the same colour would have been tricky, so I looked for timber that would blend, as well as add something to the piece. I decided to use London plane quarter sawn lacewood (Acer pseudoplatanus), for the drawer fronts and contrast this with rippled sycamore drawer sides to set off the dovetails. I was looking to try for a piston fit on the drawers and so the first thing to do was to check the carcass openings. The fit was .5mm wider at the back, which was good although the height was slightly smaller on both drawers, which proved tricky to correct in such a small piece. 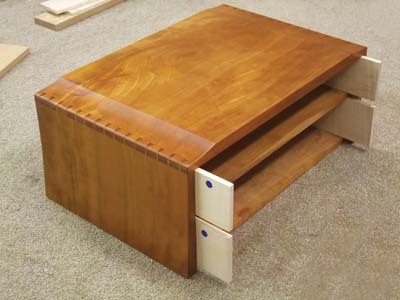 I cut all the drawer parts a little oversize and used a shooting board to fit both the sides and the front and back tightly in their openings. 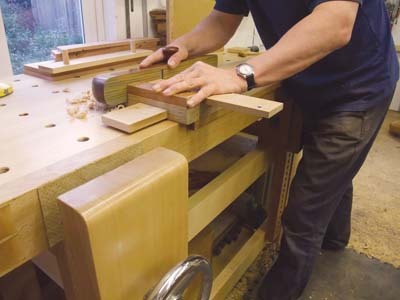 The process is well documented in Alan's excellent book Cabinet Making the Professional Approach. I decided to use half-blind dovetails for the drawer sides and realised that it had been some time since I'd cut this joint. I'd been achieving the half-blind effect on other projects by gluing a thick veneer over through dovetails. This technique saves on special timbers and also allows less stable woods such as burrs to be used without risking damage to the pins. Half blind dovetails are slightly more time consuming to cut but with only one show side they are easier to get a good result from. I cut the tails in the normal way and used my dovetail alignment jig to ensure all the parts lined up and were square when marking the pins. Any cleaning up of mismatched parts would have made the pre-fitted parts sloppy. 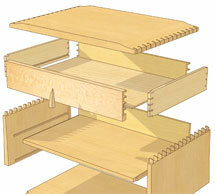 Unusually I referenced from the top edge as the drawer front was deeper than the sides. 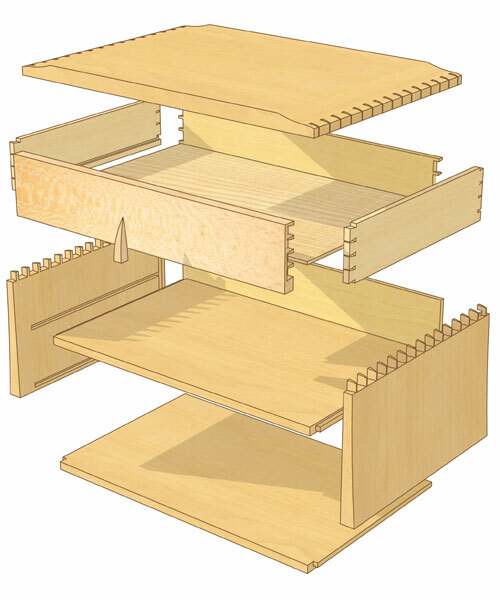 I assumed that the construction of the carcass required overlapping drawer fronts as the rails were too narrow to accommodate a finger-pull, which is one of Alan's trademark designs. I chopped the pins out carefully as any mistakes on this small scale would stand out a lot more than on a normal sized drawer. With the dovetails done I could decide on the position of the groove for the cedar drawer bottom. This was cut using a 3mm bit on the router table to a depth of 3mm (half the side thickness). 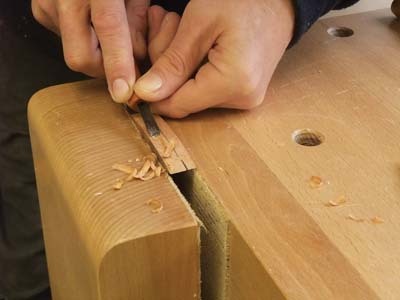 The groove could be run right through the tails on the sides as this would be hidden within the half-blind joint. 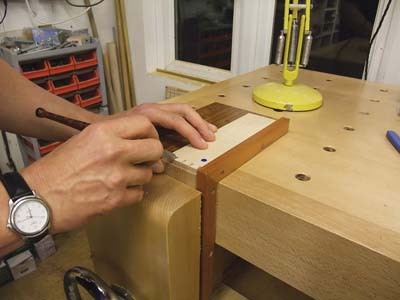 As with the alignment board, the fence on the router table was set up to reference from the top edge of the drawer parts. 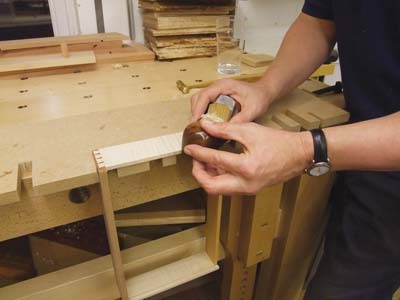 When it came to the drawer back I realised that by raising the cutter I could rout all the way through and give a perfect fit for the back to allow the drawer bottom to be slid into place after glue-up. When marking out the fronts I had made sure that the sides were left slightly proud so that when the dovetails were cleaned up material was not removed from the fronts which would have resulted in a sloppy fit. 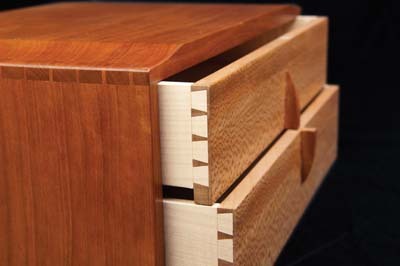 The rear of the drawer was joined up with through dovetails in the normal way and everything went together well. 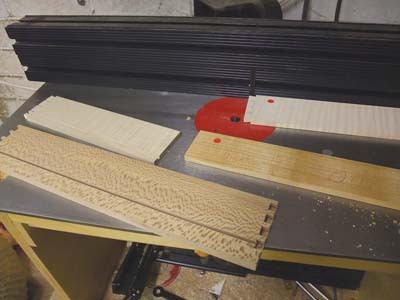 I used a drawer board to support the sides when carefully planing to a final fit and when all was done the base was inserted and the fit was re-checked. The final fit was good enough for everything to run smoothly but it wasn't quite to Alan's standards. The back panel was fielded to fit the grooves and this was made from English cherry (Prunus). The difference between the two cherries is striking. 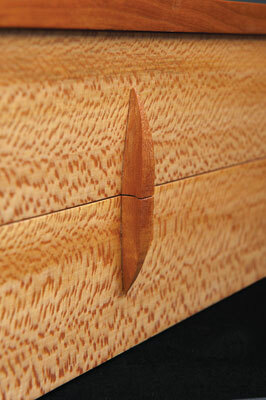 The last job was to fit some sort of handle or pull for the drawers and this was the most difficult part to design. After numerous sketches I finally decided on an elliptical shape, which spanned both drawers. drilled four 1/8in holes in the back. I then sharpened four 1/8in brass pins to a point on the disc sander and inserted these in the holes. This was then carefully positioned across the drawers and gently pressed to mark the opposing hole positions. The pointed pins were then replaced with normal ones and the handle was dry fitted to establish the exact position of the separating cut. 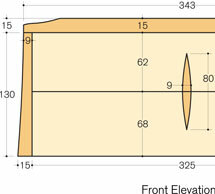 This cut was made by hand with a very fine Japanese saw with a kerf of just 0.3mm. Everything lined up well and the two halves were glued in place with epoxy. 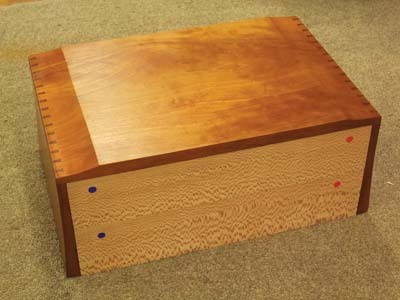 The drawer sides were waxed to encourage smooth movement and the fronts and backs were oiled. 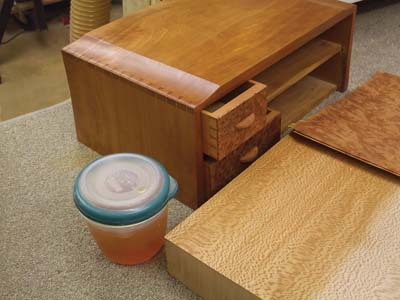 The insides of the drawers had been sealed with shellac prior to assembly and the cedar drawer bottoms were left untreated to enjoy the aroma. I was pleased with the outcome and it was good to give this little piece a new lease of life.